Pieces of ancient Egyptian beer-brewing pottery dating back 5,000 years have been found during archeological excavations in Tev Aviv among ruins of an Egyptian settlement. According to a statement from Israel's Antiquities Authority, the shards were found under an office construction site in 17 pits used to store agricultural produce in the Early Bronze Age (3500-3000 BC). The ceramic vessels were made using an Egyptian method that differed from local pottery-making at the time. Archeologists have also detected a thick, partially baked water and barley mixture left to ferment in the sun. “Among the hundreds of pottery sherds that characterize the local culture, a number of fragments of large ceramic basins were discovered that were made in an Egyptian tradition and were used to prepare beer. Beer was the Egyptian national drink and was a staple along with bread,” excavation director Diego Barkan said in a statement. It is said that beer was consumed by the entire population of Egypt – regardless of age, gender, or status. “It was made from a mixture of barley and water that was partially baked and then left to ferment in the sun. Various fruit concentrates were added to this mixture in order to flavor the beer," the Antiquities Authority said in its statement. Previous excavations in Egypt's Delta region revealed breweries which prove that beer was already being produced in the mid-fourth millennium BC. 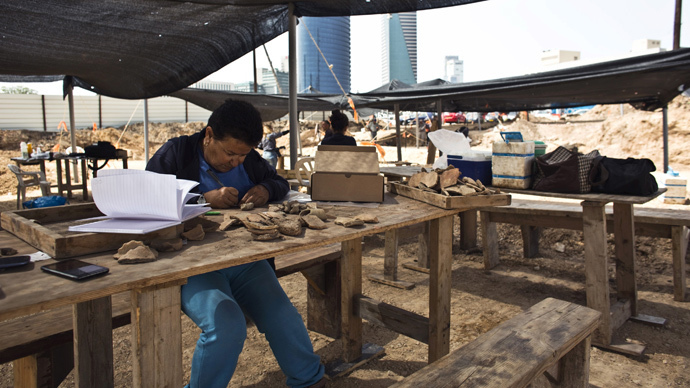 The recent excavation is the first to prove Egypt's presence in the center of Tel Aviv 5,000 years ago. Earlier archaeologists in Israel found evidence of Egyptian communities to the south, in the Negev and along its Mediterranean coast.